Bauerfeind MalleoTrain reinforces the stability and strength of your ankle joint. 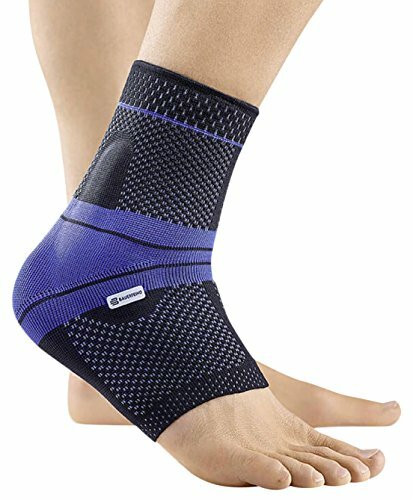 With a special knit fabric that fits the natural shape of your ankle, the MalleoTrain brace delivers medical grade compression without hurting pressure points. Comfortable Fit: With every movement you make, two soft pads become active, massaging the ankle joint. Cushioned pads support the inner and outer ankle bones to reduce swelling and provide even more stability. Used to treat and prevent: Mild ankle sprains, mild instabilities, ankle arthritis, ankle pain and ankle swelling. All Bauerfeind products are made in Germany with the highest manufacturing standards to ensure superior quality. Bauerfeind technology has evolved over the past 80+ years and continues to set the standard in fit, comfort, support and performance.